Performs external IP address and location lookup. Shows configurable event countdown with customizable sound (optional). Supports world times, can be adjusted for time zones and daylight saving time. 5.0.0 - 2019-01-03: Reuploaded .rmskin to correct packaging error. 5.0.0 - 2018-12-21: Revised Calender to handle issue where auto-configuration could fail in rare cases. 4.1.1 - 2018-07-08: Enhanced Weather Meter to allow searching for weather.com location codes. 4.1.0 - 2018-04-27: Corrected All CPU Meter issue where fan usage may not be calculated correctly in rare cases. 4.0.0 - 2018-03-17: Enhanced Digital Chronometer to use new SysInfo USER_LOGONTIME to get logon time. Enhanced GPU Meter to support Qualcomm Adreno GPUs (preliminary; requires HWiNFO support). 3.0.2 - 2018-03-17: Corrected Weather Meter gadgets for date formatting issue when using leading zeros. 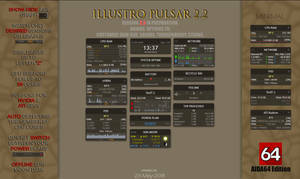 Calendar gadget is LuaCalendar 5.0 by Smurfier, with scaling enhancement added by TGonZ0, and with localization and style mods by me. Awesome gadgets! Any way to add the Dew Point to the weather meter? Yes, that data is available but it would require editing the skin to include it. It wasn't part of the original addgadgets.com Weather Meter, which is why I left dew point and UV index off the display. I think this is the best monitor out there, I have had a few, but this was the best re-creation of the ones I used in Win7. Glad to hear! 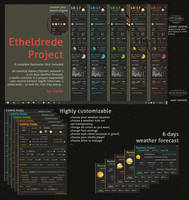 I'll address your concerns with the Weather Meter instructions in the next release (whenever that happens). Thanks for the feedback. Hahaha, funny story, after I posted that I figured out how to use the search function in the widget, so I got my town working. But thanks for the fast reply, and update. Uh, can you make the calendar to display events based on country as well? Not everyone lives in the USA. Clearly I am aware not everyone lives in the USA, but if you think I'm going configure this for every country in the world, you are sadly mistaken. The calendar is a reskin of LuaCalendar, which has the ability to show anything you want. All you need to do is configure the CalendarEvents.xml file, following the instructions here: smurfier.github.io/LuaCalendar…; see the "Using Event Files" section. I left the USA configuration in place so it would be easier for people to see how to configure holidays and events, using the US days as examples. I should add instructions for doing this and add a link to the XML file in the Settings skin; I will do this in the next release so people won't have to dig around in the LuaCalendar code to figure it out. For some reason i noticed that for a while now i no longer get GPU VRAM readings, only the percent bar still works. I think it's been from a recent HWiNFO update. Any idea how to fix this? I updated to the latest version of the gadgets but it's still the same. Looks like your fan display isn't working either (0 RPM but at 39% usage). Not sure if this is due to a HWiNFO update, but it does look like it is simply that your sensor and/or entry IDs have changed. Check the entry IDs for HWiNFO-GPUx-MemoryAlloc (GPU RAM in use in MB) and HWiNFO-GPUx-GPUFan (fan speed in RPM), where "x" is your GPU number. Fixing those should make everything show correctly. Funny enough, i just got a notification for an update for HWiNFO, i'll try what you suggested and see if i can fix it, but i was wondering, why would one meter work but the other wouldnt't? Don't they check the same sensor to get the data? For example, how would he know i have used 85% of my VRAM if he doesn't know how much i have in the first place? Actually, if the settings are configured properly, it DOES know how much VRAM you have. It just takes a little math. For example, it knows the percentage (say 85%) and it knows the amount in use (say 1825 MB). So if you do the math, 1825 / .85 = 2 GB, so the gadget knows you have 1.8GB in use, 322 MB free (2GB - 1825MB), and 2 GB total. Easy... the problem is that your "memory allocated" entry is returning zero, so everything shows up zeroes. Once you fix that, you'll be good to go. Even if I mouseover Drives Meter, the total number of bytes is not displayed. Is it because the version of Rainmeter is 4.3? Thank you for the gadgets. However I'd like to report 2 issues with the weather gadget. The wind direction appears to have its direction inverted, and the pressure doesnt have the rising/falling arrow. 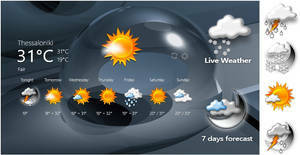 weather.com seems to have changed that item to be an icon in the web code instead of some kind of character arrow that could be captured and displayed. Hello! For the wind direction, the arrow is supposed to point INTO the wind (upwind), as it tells you where the wind is blowing FROM. So if you see the weather.com data saying the wind direction is "S", then the arrow will point north. This convention is from the days of people using weather vanes, where the "feather end" of the arrow is downwind, and the pointy arrow end is upwind. More info here: www.wikihow.com/Read-Wind-Barb…. For the pressure, there is no arrow. The gadget does not pull data from the weather.com website, it is pulling from their XML data feed, which is completely different. The weather.com XML feed uses the words "rising", "rising rapidly", "falling", "falling rapidly", or "steady"... or nothing at all. These words can be translated into arrows if you want, but this is not the style that was used in the original addgadgets.com Sidebar gadget. This is a very simple tweak to the language variables, so if you want arrows let me know. @SilverAzide : Absolutely fantastic work man.... Been using Rainmeter for some years now and I've gotta say this version of gadgets is the bomb! Just one issue for me. Everything is working great except for the GPU (and CPU) fan readings. I can't find any fan readings on HWiNFO either. I have a laptop with a dedicated Nvidia GTX 1060 card so I understand should use GPU #1? Appreciate any tips. Cheers! Hello, glad to hear you are enjoying the Gadgets! Fans are a little tricky, I have a laptop with a dedicated nVidia card as well so I know what you mean. It is possible that the fan sensor is actually on the motherboard (not the GPU), so check there instead. The GPU Meter is able to work with this scenario, so make sure you follow the notes about this in the HWiNFO.inc file's comments. Also, most laptops these days have 2 GPUs, the built-in Intel GPU is usually GPU #0, so as you guessed, GPU #1 will be the one you need to configure for your nVidia card. 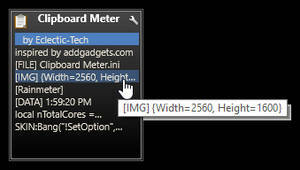 But if you want to, you can configure ALL the settings with your nVidia card's sensor IDs, then any GPU Meter will work. For your CPU fan sensor, that is almost always controlled from the motherboard, so check there and hopefully you will see it. Good luck! SilverAzide Thank you for the help. On Shared Memory Viewer I can see that the ID for the CPU RPM value is 0xf0ec0805 and the instance is 0x0, which is already being used by the skin with [MeasureMoboCPUFanRpm]. So not sure why i'm not seeing fan readings on the CPU meter. Anyway, it's no big deal. Regarding the GPU, there was one more thing I hope you can help me with. The GPU memory usage percentage value and bar line work OK, but the values above in blue (Used, Free and Total) are all 0. On the summary window of HWiNFO I can see the correct graphics card Physical Memory Size (3gb), but when I pull up Sensor Status I can't find this reading. The only memory values I see are: GPU Memory Allocated, GPU D3D Memoery Dedicated and GPU D3D Memory Dynamic, which show much smaller values. Any ideas? Thanks again! Once these three config values are set, you should see the fan in the CPU Meter. If the CPU fan sensor is NOT on your motherboard, let me know and we can try another option (let me know where HWiNFO says it is). For the GPU Meter, it sounds like you have correctly configured the "memory usage percentage" setting, but not the "memory allocated" setting. Make sure the Entry ID is correct for this setting. Also, make sure you have configured the correct GPU. Your graphics card is probably GPU #1, so make sure you have configured this section in the HWiNFO.inc file and are using the GPU Meter #1 skin (or just configure all 3 sets of GPU variables in the HWiNFO.inc file with the GPU #1 values from the Memory Viewer). 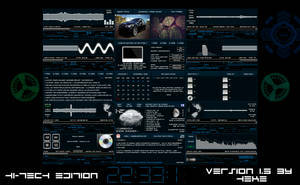 By the way, all this complexity is because of HWiNFO, not Rainmeter or the Gadgets. 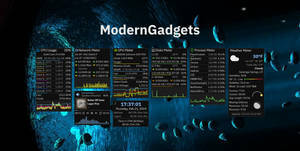 HWiNFO is really nice, but it is a huge pain to get configured to use with Rainmeter. Then I edited the HWiNFO.ini configuration file and used the same settings under [HWiNFOCPU0Fan]. Does that sound right.... editing these 2 separate files to get the result? Now I seem to getting some sporadic CPU fan readings. I am assuming that the CPU fan sensor is in fact on my motherboard (not sure how to check that). As for the GPU skin, I didn't actually configure anything before. The skin automatically gave readings for "memory usage percentage" but not Used, Free, Total GB readings. So for "memory allocated", [MeasureGPUMemAlloc], I used the following settings below and voila! now the Used, Free and Total Values show up. So now the only thing I'm missing is the GPU fan reading. Try as I might, the only sensor I can find with an RPM is for the CPU fan. Anyway, it's just a bonus. And yes, I can only imagine the complexity of developing these skins in configuration with HWiNFO. The community is lucky to have helpful and creative developers like you. I'm grateful for the help you've given. Cheers! Hello... Unfortunately, you should not have edited the skin files. It is totally unnecessary to do that, as all the settings you need are in the HWiNFO.inc file. The whole purpose of this file is to have one place for everything HWiNFO-related. I'd suggest restoring the files to their original state and following all the instructions at the top of the HWiNFO.inc file, which details everything you need to do. You can identify which sensor your fan is on by looking at which group it is in in the Shared Memory Viewer (SMV). The SMV groups items by sensor, so there is a sensor for your GPU, another for your motherboard, one for each drive and network adapter, etc. There are several for the CPU (clocks, temps, etc.). The fans are usually on the motherboard sensor, except for desktop video cards which usually have their own fan on the card. Fans can also be on the PSU, a dedicated controller, etc., so things can vary greatly. For your missing GPU fan, that is strange... I can't imagine that card is passively cooled (i.e., no fan). If HWiNFO can only find one fan on your whole system, then I guess you are out of luck. HWiNFO can usually see everything, but maybe there is something about your system that is different. You might have luck checking on the HWiNFO forums. The developer of HWiNFO keeps the app current and issues frequent updates, so check often for app updates. I'm using the analog clock, and I'm getting the chime every hour. The description says it's configurable, but how? I've tried clicking on the music note button but it doesn't do anything. I can get the regular settings open no problem. 2. Click on "Configure alarms..."
A ha....ok cool. At first I totally wanted to disable the chime altogether, but now I like it. Helps me keep track of time. At least now I know where I can change the chime to a different tone if I want. Thanks. Me too! I like the one hour reminder a lot! I have it set for birthdays as well. Found that Analog Clock and Alarm Settings won't work for me with e.g. "Windows - ding.wav"
Alarm Settings doesn't like the empty space. If I make a copy of ***.wav file and change to "Windows_ding.wav" all is good! I just love my Gadgets! Spaces in the names aren't working? Hm, that sounds like a bug! I'll look into fixing that in the next release, probably just some missing quotes somewhere. 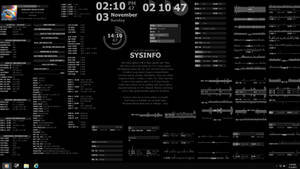 Quotes in Rainmeter are tricky... Thanks for letting me know! I earlier wrote about Analog Alarm Clock but I'm using the Digital Alarm Clock. Don't know if that matters regarding the spaces in the name of ***.wav file. I was going to change the alarm sound and found out that now it works with space in filename?! Don't know if it has someting to do with installing (keeping settings) to the latest release of "Rainmeter 4.3 Final Release - r3298"? Anyway, all is good... I love my Gadgets! Thanks! Love the work you're doing here, mate. 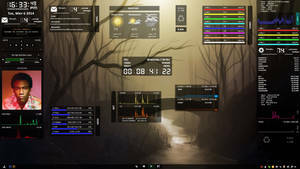 Not sure where I stumbled across the screenshots of the skins but it has driven me to try Rainmeter for the first time hence, my rather noobish question for you related to the CPU Usage skin. I have an intel i7 9700k which has 8 logical cores (no virtual cores or hyperthreading). The CPU usage skin has detected and displaying all usage information except for the individual core temps of cores 5, 6, 7 & 8. HWMonitor is reading and displaying everything as normal though. Could you please point me in the right direction as to how I can rectify this? Glad you are enjoying the Gadgets! I assume you are using HWiNFO. If so, make sure you have configured the sensor and entry IDs for those cores (the IDs are not configured by default). More info here: www.deviantart.com/comments/1/…. how to change Weather timezone?? Hello! You do not need to change the weather timezone. The timezone bias comes from the Weather Channel data. All you need to do is select the location. Click the wrench icon to open the Settings, then enter the location code or select the search icon to search for a location code. but. all time is UTC +0..not +8. Thank you for the info, this was very helpful. The problem is not with the Weather Meter skin. The problem is that weather.com is sending your timezone bias ("timezone") as "0", for GMT time. Obviously, this is incorrect for your location. Weather.com may fix this in a day or two, or they may never fix it, there is no way to know. Good news: you CAN fix this easily. But this fix will only work for your current location. If you want the weather in a different timezone, you will need to change the offset again. 1. 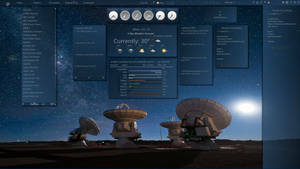 Right-click the Weather Meter and select "Edit skin". 2. Search for the measure "[MeasureLocationTZOffset]". 4. Save the file and refresh the skin. Your sunrise/sunset and moonrise/moonset times should now be correct. Please note that the "Update" time at the bottom is coming from weather.com and it is in GMT time. also. 5day Weather is UTC+0. moos is showing First Quarter..hko.gov.hk is First Quarter too.. The 5-day Forecast skin will have the same issue with the time, since it is pulling the data from weather.com just like the main skin. 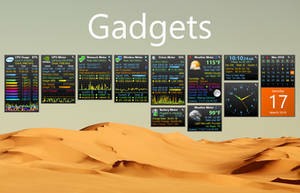 To fix it, open the skin file in Documents\Rainmeter\Skins\Gadgets\Weather Meter\Flyout\Flyout.ini and make the same change as described above. These two skins work the same, so any changes you make to one you will have to make to the other as well. For your last item about the moon phase being incorrect (First Quarter vs. Waxing Crescent), that is a weather.com issue. The wxdata feed was wrong, but it appears to be working properly now. For the moonset/moonrise times, it appears the date and time is still slightly off, so the calculations are incorrect. I'm not sure how to fix this at this time, I'l need to investigate further when I have more time. I see the problem. Because of the incorrect time zone coming from weather.com, the sun and moon times are actually being calculated for the wrong day (they are for the previous day). So far I have not been able to figure out how to fix this. Sorry. I had to log in before I could download it, if that helps. is there any way to show cpu vcore on the gadget just like on the gpu gadget? 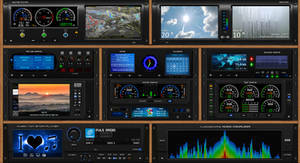 That would be really useful as i would like to monitor the vcore during stress testing or gaming (i got a mini display on my case where i place monitoring gadgets to get my reading during testing or gaming). Is there a way to edit this myself? 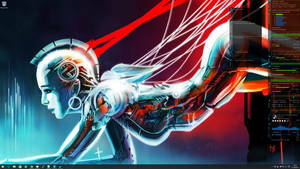 Your work is really amazing btw, maybe the best monitoring skin for rainmeter out there. Hi, yes I am using hwinfo. I was more like thinking to get the vcore reading from the motherboard sensor (same as the reading in CPU-ID) instead per core voltage from the cpu. Like a single red line above the graph reading Vcore or Core Voltage, much like the GPU Gadget. I can trace all my sensor's id's just I'm not so familiar with editing rainmeter skins but I think I could dig around..
Love these gadgets! When I came across them the first time, I was in a monochrome desktop phase, but now I'm LOVING all the colors! I've had no trouble setting each gadget, your settings files are wonderfully clear. Now my question... I saw in your description that the Drives Meter only works on fixed and removable disks. I routinely use a NAS device connected to my router and would very much like to keep tabs on it. 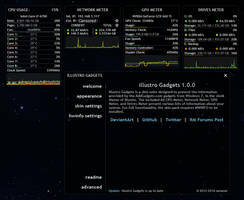 Are there any solutions that you've come across since you built the skin that would allow Drive Meter to monitor a network drive? Great work! Thanks for spending so much time on this. Unfortunately, there's not a way to monitor a network drive. Windows does not have performance counters for network drives, only for physical drives. You could in theory use HWiNFO to monitor a remote machine's physical disks, but it requires Windows on the server-side and most NAS boxes are Linux-based. The closest thing you can get is using the Network Meter, but there's no way to distinguish traffic from the NAS from any other network traffic. 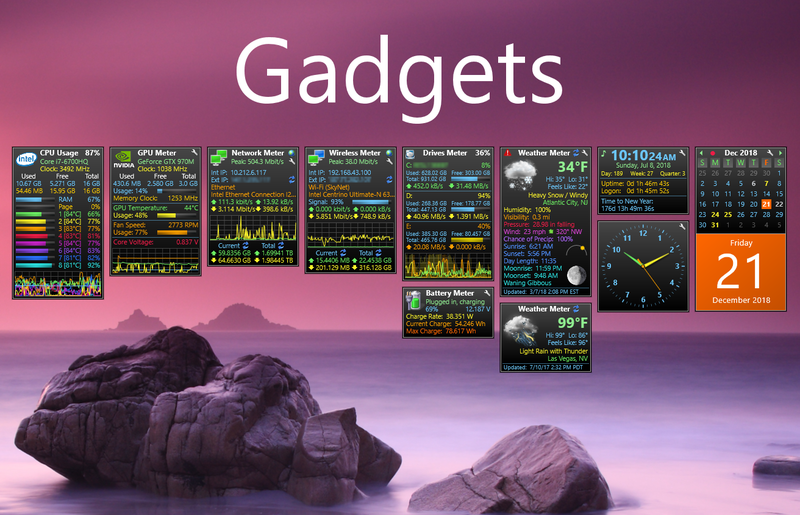 Basically, these are all Windows limitations, nothing to do with the Gadgets or Rainmeter. Sorry! Ah bummer. The Gadget and Rainmeter are both fine, I knew it was a windows thing, but was hoping you'd come across something in your travels that could do it. I might fiddle with HWiNFO, just to see. If I happen across a solution would you like me to let you know? I can't remember when I downloaded this at, but I've been fiddling with the INI files to remove certain information and try to make the gadgets look nice after but failed to some extent, its kinda all screwy now. I'd like to suggest some options for some of these gadgets. Hide "logon uptime", as it is different from "uptime" and pointless in my view. For some reason it was an entire day wrong. I'll show you a preview of my setup so far. Its still a little, brokenish because I have adjusted the BgHeight randomly trying to achieve a nicer look. I can send you the INI file edit I did for them too if you feel like taking a look. For the Clock, I simply deleted the lines related to logon uptime. For Network Meter, I edited a ton of things to remove the IP but its still broken because it has an invisible snap point at its original location so I can't put this meter above others. I've actually been using these for a long time now though, I only edited network meter today to try and remove the extra space left behind when I originally deleted the IP address. I don't use DevientArt so I likely won't notice if you reply, you can poke me on Telegram if you want, same as my username.